The Generalgouvernment of Poland issued the three stamps shown above (Mi. #89-91, Sc. #NB12-14) on April 20, 1942 to celebrate the 53rd Birthday of Adolph Hitler. In a departure from the manufacturing process of earlier stamps, this issue was engraved on thick cream-colored paper, and perforation gauge 11 was used for them. The four stamps shown above (Mi. #92-95, Sc. #NB15-18) were issued August 15, 1942 to mark the 600th Anniversary of the City of Lublin. The 12 G. and 50 G. denominations picture the "old town" of Lublin. The 24 G. and 1 Z. denominations picture the "new city" of Lublin. The oldest settlements at Lublin date back to about the 7th Century. Today, Lublin is the largest city in Eastern Poland and is an important cultural center. On a much darker note .... During the NAZI occupation of Poland, Lublin served as headquarters for Operation Reinhardt, the main German effort to exterminate the Jews in occupied Poland. The Jewish population was forced into a ghetto near Podzamcze. The majority of the ghetto's inhabitants, about 26,000 people, were deported to the Bełżec extermination camp between March and April 1942. The remainder were moved to facilities around the Majdanek concentration camp established at the outskirts of the city. Most of them had been murdered by the end of the war. On July 24, 1944, the city of Lublin was liberated by the Soviet Army. 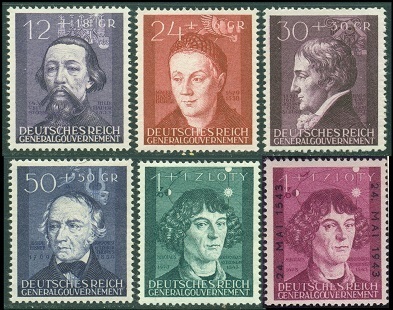 The first five surtaxed postage stamps shown in the image above (Mi. #96-100, Sc. #NB19-23) were issued on November 20, 1942. 12 G. + 18 G. - Veit Stoss (1447-1533). Sculptor. 24 G. + 26 G. - Portrait of a Young Man, from a painting by Hans Dürer (1490-1535). 30 G. + 30 G. - Johann Schuch (1752-1813). Architect. 50 G. + 50 G. - Joseph Elsner (1769-1854). Composer. 01 Z. + 01 Z. - Nicolaus Copernicus (1473-1543). Astronomer. The sixth stamp shown in the scan above (Mi. #104, Sc. #NB27) is the same design as the 1 Z. + 1 Z. denomination issued on November 20, 1942. This particular stamp was printed in magenta and has an overprint at each side reading: "24 Mai 1543". It was issued on May 24, 1943, to commemorate the 600th Anniversary of the Death of Nicolaus Copernicus. The set of new official stamps shown above (Mi. Dienstmarken #25-36, Sc. 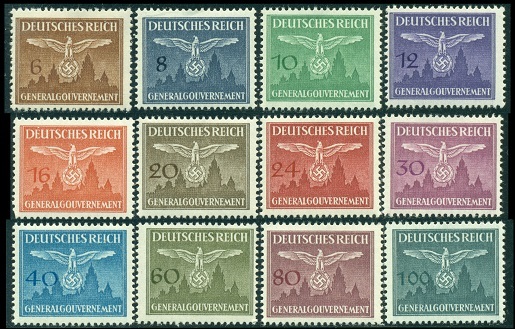 #NO25-36) were issued in February 1943. 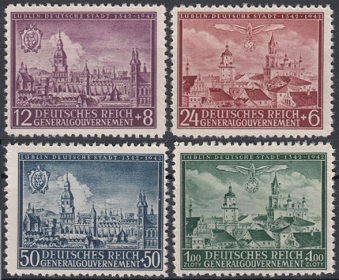 They are of the smaller format, as were the official stamps issued in late 1940. These new stamps feature the NAZI emblem above the silhouette of the City of Krakow with the denomination at the left. The Generalgouvernment of Poland issued the three surtaxed postage stamps shown above (Mi. #101-03, Sc. #NB24-26) on April 20, 1943 to celebrate the 53rd Birthday of Adolph Hitler. 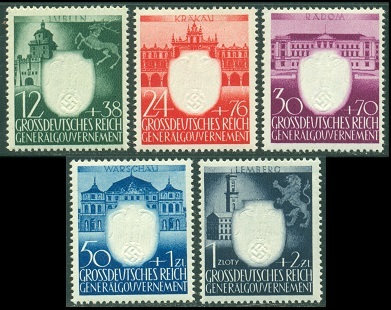 The five surtaxed postage stamps shown in the image above (Mi. #105-09, Sc. #NB28-32) were issued in August / September 1942 to celebrate the 3rd Anniversary of the National Socialist Party in the Generalgouvernment of Poland. 12 G. + 38 G. - Krakow gate in Lublin. 24 G. + 76 G. - Cloth Hall in Krakow. 30 G. + 70 G. - New Government Building in Radom. 50 G. + 01 Z. - Bruhl Palace in Warsaw. 01 Z. + 02 Z. - Town Hall in Lwow (Lemberg).